With the number of senior citizens in the EU dramatically increasing, the burden in terms of public expense rises concomitantly. This is the motivation behind OLDES (Older peoples e-services at home), a three-year project funded by the Information Society Technologies Programme of the European Union. Today an increasing number of elderly people are living alone, in many cases with no families helping them and not enough money to afford private carers. The goal of OLDES is to plan and implement an easy-to-use, low-cost innovative technological platform. The platform will be tested by 100 elderly people in Italy (ten of them affected by heart disease) and a sample of diabetic patients in Prague. This project is strongly supported by the Bologna Town Council. Its Health Department believes that the welfare model must be rapidly renewed, making the most of new technologies and high-tech devices to offer tele-medicine, tele-assistance, tele-entertainment and tele-company services to a wider number of senior citizens. The aim is to augment the number of people assisted by public services, even if public resources decrease as the number of elderly increases. OLDES is considering three main categories for care  entertainment and companionship, clinical monitoring, and domestic monitoring. The project will define an innovative and alternative welfare system in which technology will be customized according to user needs and employed on a large scale. 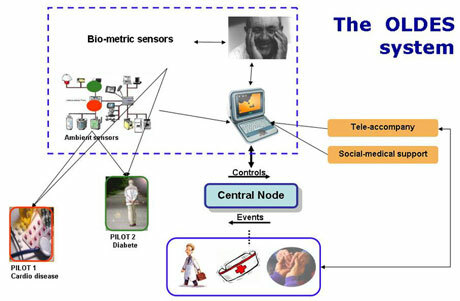 In the OLDES vision, the future will see all elderly people who live in cities and suburban areas being tele-assisted. This would contribute greatly to a simplification and systemization of social services and would save public money. The technology proposed by OLDES represents a cost-effective and humane solution that will allow the elderly and their families to live more serenely in their own homes. OLDES will be an easy-to-use, plug-and-play system with different costing levels, according to the profile of the person assisted. A base level will be available for everyone, which includes communication and tele-company and which will be simply based on a low-cost PC and open-source software with a target price of around 100 per person (corresponding to Negropontes paradigm of a $100 device). The intermediate level will involve the addition of simple sensors (eg to measure the ambient temperature) for the management of generic monitoring situations (eg very hot periods in the summer). Finally, an upper and tailored level will include health-monitoring sensors depending on the health profile of the user. The starting point will be the construction of usage scenarios, which will help to produce results that are of wider interest and applicability on a European scale. For this reason, OLDES will perform a market study based on two strategies. These are the development and progressive refinement of a set of generic usage and provision models, and a service-component approach to the packaging of technical developments to ensure maximum flexibility and configurability. For products and services that support the provision of social care, market analysis and exploitation planning is more complex than when commercializing a device or testing a medical or therapeutic procedure. In order to address the diversity that exists in the context, provision and funding of care services, the project will generate a set of care delivery models that are grounded in practice but are sufficiently generic to provide a framework for the deployment of the OLDES components. These models are an essential component of the broader OLDES architecture, and their evolution and refinement is a process that will continue throughout the life of the project. They are both conceptual and descriptive but must also provide quantitative data upon which service and business planning can be based. The usage and provision models provide one mechanism for addressing the diversity of the OLDES market. To maximize the flexibility and therefore the exploitability of the OLDES products, it is also required that our technical outputs are packaged appropriately into highly configurable service components. We use the term service both in the sense of client service to older people and also in the sense of technical service components as part of a systems infrastructure. The service-oriented approach employs a simulation and interactive development strategy by which real service components replace simulated ones in an evolving reference implementation. The combination of an essentially infrastructural service-oriented approach and the potential for innovation and change mean that conventional market analysis models are of limited applicability to OLDES. These assume that evidence of demand, as opposed to latent need, can be readily elicited through conventional market research techniques. Such approaches are not only of limited applicability to public service contexts but can actually be misleading. Conventional market analysis can only operate in the incremental development mode and cannot cope with propositions that may, for example, fundamentally change the shape of the provision value chain. The approach to be adopted by OLDES is of incremental development, client and user participation and the use of animation and simulation in a reference implementation context. This design should ensure that possibilities for change remain open while development is, at all stages, grounded in the realities of social care, the cultures and economies of the specific pilot contexts, and as wide a range as possible of other European public service contexts.